McDonalds offers you Special Screening Exclusively for McDonald’s customers at Majestic Cineplex on 18th June 2014, what you should do is; enjoy your happy meals at any McDonald s restaurant between 5th June to 10th June 2014 and to try your luck. 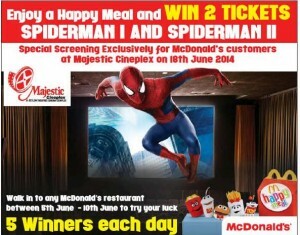 5 Winners each day, if you lucky enough you will obtain tickets to watch Spiderman I and Spiderman II on Majestic Cineplex on 18th June. For more details see below image or visit to nearest McDonalds. The Lumala Cycle a Biggest toy chains in srilanka with a range of over 4200 toy items gone on special promotions of 20% off. 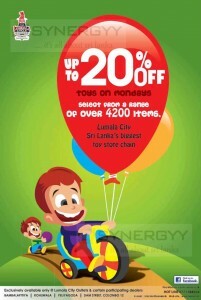 Now the offer is valid only on the Lumala stores of Lumala City Outlets & Certain participating dealers. Bambalapitiya, Kohuwala, Peliyagoda, Dam strret, Colombo-12. For more information see below image or call Lumala on 0771088604. 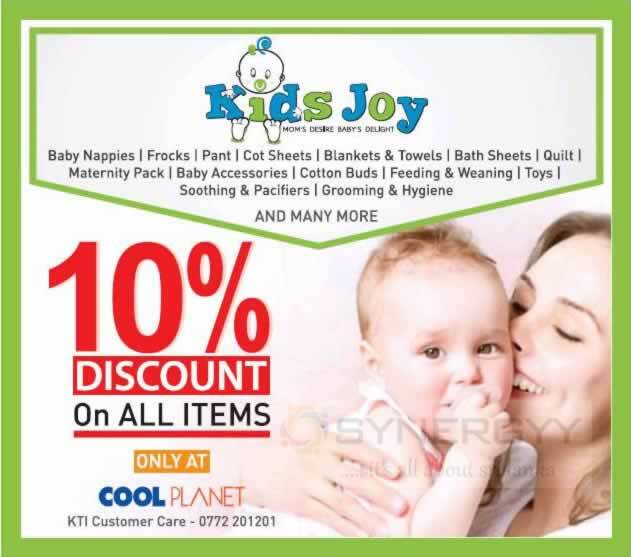 Enjoy a special 10% discount from Kids joy on all Item at Cool Plant. This offer valid for Baby nappies/frocks/pant/cot sheets/blankets & towels/bath sheets/quilt/maternity pack/baby accessories/cotton buds/feeding & weaning/toys/soothing & pacifiers/grooming & hygiene and many more. 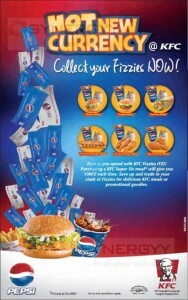 Earn as you spend with KFC FIZZIES (FZ)! 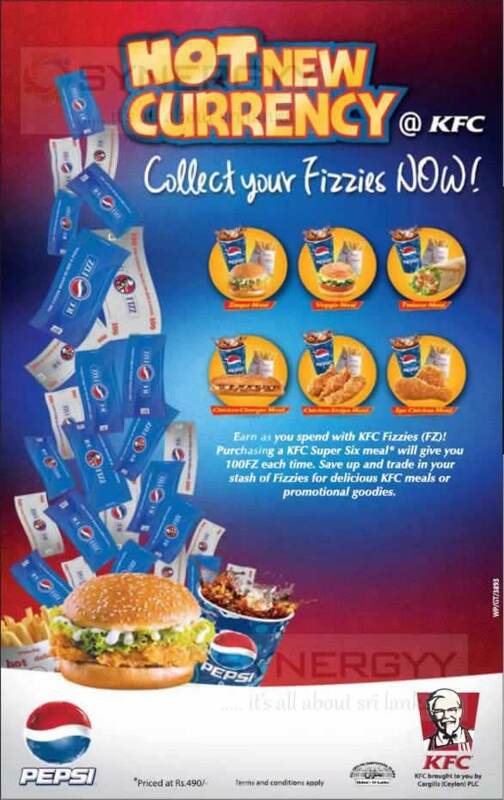 Purchasing a KFC super six meals will give you 100FZ each time. Save up and trade in your stash of FIZZIES for delicious KFC meals of promotional goodies. Calling all kids from 5 to 12 years! Join us for a day full of fun and games before school reopens. Exciting games, competitions, prizes 3nd refreshments await you. It’s the perfect end of a happy school vacation on 31st August 2013 from 9.30 Am at Abans Elite Showroom Kollipitiya . Hey kids! KFC now gives you another reason to try out the KFC kid’s meal menu. 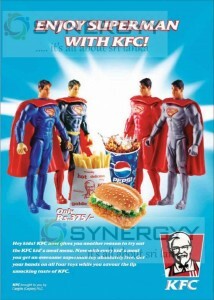 Now with every kid’s meal you get an awesome superman toy absolutely free. 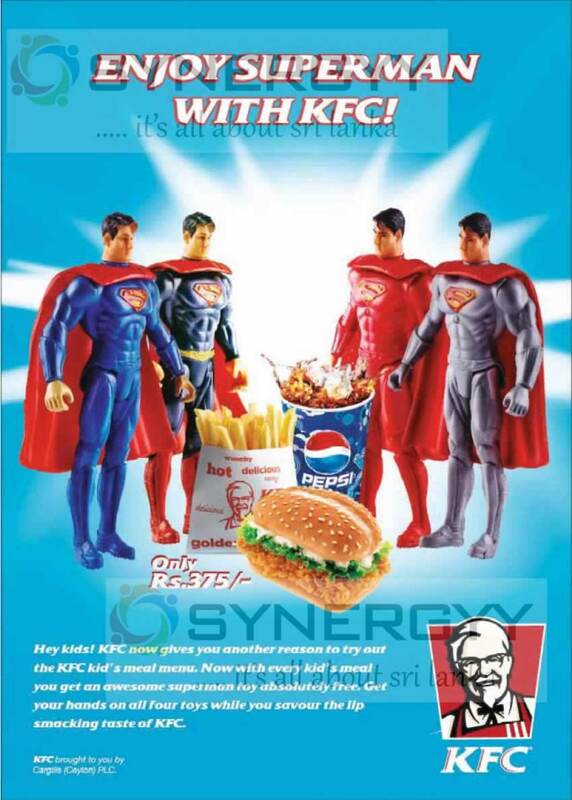 Get your hands on all four toys while you savour the lip smacking taste of KFC.